Im having an extremely hard time Setting this car up, which is strange considering in PCARS 1 It was easily my most driven car, and I was able to tune it on a dime. but in PCARS 2, Im getting nowhere. I need a hand with it, Getting some general, stable settings for the car so I can go from there. Currently what im having issues with is the car feels EXTREMELY unstable, its really snappy. I had to turn Stability control on to keep the car from spinning out in my first LMP1 race on Fuji. Im also having weird issues where the car is turning too much for corners, not oversteering and swinging the back out, but when you turn it just turns in way to much. which leads me to believe I can take the corner faster, but when I do it either completely understeers and plows straight forwards, or becomes really loose at the rear causing me to have to slow down to keep it going straight. Turning Stability control off caused it to just spin out on every corner. TL;DR. Need a good, stable, base setup for the RWD P30 LMP1 that I can trim for different tracks. thanks! Last edited by Zekken; 27-11-2017 at 21:11. Well, you could try the default stable with a steering ratio of ~13.5:1 or more. From what you describe as the problem it just sounds like the steering is too fast and darty for your tastes. that would solve that problem, I admit I never even thought about steering ratio. I thought it was a suspension/damper issue. though that won't solve the problem of it spinning out in corners constantly with ASC off. Last edited by Zekken; 27-11-2017 at 21:56. ... that won't solve the problem of it spinning out in corners constantly with ASC off. Only proper tires and good technique fixes that. Assuming you know the basics, aim for hot tire pressure of ~1.8 bar, and if the soft slicks are >90℃. Try the hard tires. Adjust brake ducts and pressures to suit. Remember brake temps affect tire temp and pressure. Solve the 1st problem and these may just fall in place. Have you tried the default loose setup? A click more wing at the back will fix the high speed oversteer. You can fix the understeer by braking a fraction early. Im confident I know the basics at least, Im running max Downforce, soft tires, and like 15% brake duct openings. Currently I have a setup thats stable, but slow. Im 3 seconds off the pace with 65% AI, after 3 hours of tuning. I'm getting extremely frustrated since I was running 75% AI in the GT3 championship, and in PCARS 1, with this exact car, I was running with 90% AI and still keeping ahead. edit: haven't tried the loose setup, I felt it was pointless because its constantly oversteering in fast corners in the stable setup. edit2: so even the loose setting is understeering in slow corners. Im having to slow down way to much to get around the corner. Now, I've turned on the racing guide line to make sure im taking correct lines, and Im having to slow down WAY more than 65% AI (which are supposed to be running the default setup?) to get around corners, despite following the line almost exactly. Last edited by Zekken; 27-11-2017 at 22:52. Increase speed sensitivity in controller settings by 5 or 10. What you might be feeling is a controller problem, not a car problem. The P30 has enough downforce to be very stable at high speeds. Also try reducing AI to 60 or less. Seems to me that max aero on this car causes the front to outdo the back, that's why you're getting oversteer at high speed. I can't remember for sure, but I think the front diff has a huge amount of viscous coupling to it by default. I just turned everything else off and put a pretty tame torsen diff in place. I took most of the coast locking out of the rear differential, this car seems to like to push. I also tend to move the brake bias rearwards a bit, but even so this car seemed too happy to lock up the fronts. Reducing that reduces understeer. You can try now again with the new BoP that SMS do it for the RWD P30 in the last patch. 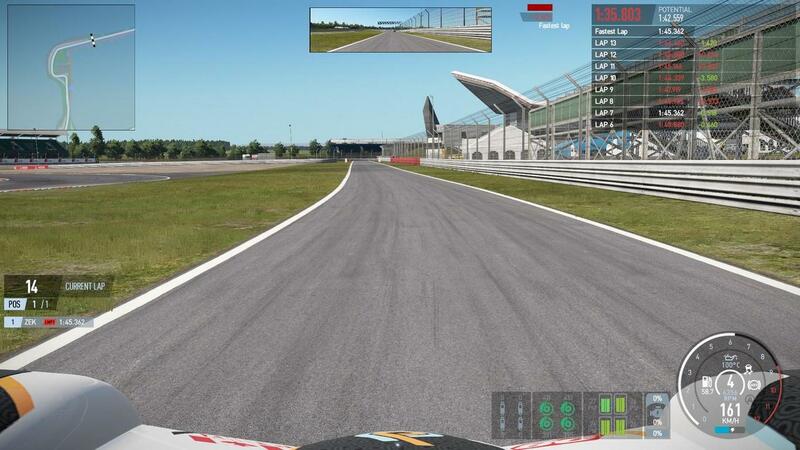 Now, I can improve 10 seconds at LeMans with same LMP1 car and setup. The P30 now is more stable and have more power on the engine (I can got 330 Km/h at LeMans instead of only 310 Km/h some days ago). This setup is Pretty good. Im actually running it with ASC off right now and its perfectly smooth and stable. Im not having any of the jerkyness that I was having in the OP. however, Im getting a fair amount of understeer. I've fiddled with it a bit, I dropped the rear Clutch LSD Preload to 30NM, upped the front spring rates a bit, changed and then reverted a couple other changes, and im currently experimenting with upping the downforce to 8/10 Front/Rear as I wasn't getting enough downforce through the faster sections of SilverStone GP. If there are any suggestions for minor edits to give me a bit more cornering ability without sacrificing the current smoothness, I'd appreciate the input. However, Im now managing to Hit VERY consistant 1:45s. Its still maybe a second slower than I'd like though so a little bit more fiddling is needed.